CCleaner program is very popular among Windows users. The program is widely used to free up disk space by deleting junk files generated by Windows as well as third-party programs. In addition to cleaning up junk files, the program can also be used to remove unnecessary entries from the context menu, analyse disk space, and repair Windows Registry. One of things I am not so happy about CCleaner is its Alert popup which appears because of active monitoring system. By default, the active monitoring system continuously runs in the background and displays Alert messages on the screen when the accumulation of junk files exceeds half a GB. The following CCleaner Alert dialog pops up when you can save more than 500 MB of disk space by deleting junk files. 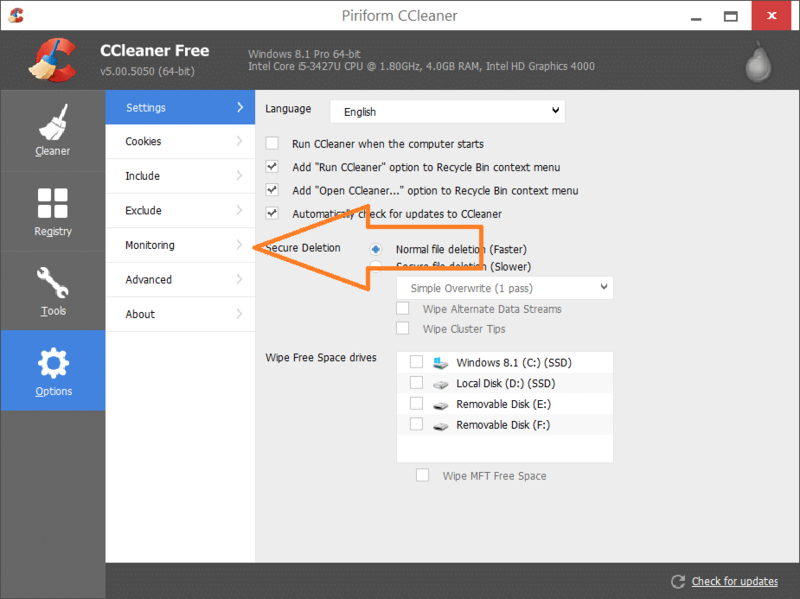 Clicking the Click here to open CCleaner button will open up the Cleaner feature of CCleaner, where you can select applications and Windows programs that you want to select or deselect. The feature is very handy as you don’t need to run CCleaner on regular basis to free up disk space and optimize your PC. But, at times, the CCleaner Alert popup irritates when we are in the middle of something serious. One way to avoid CCleaner Alert is to increase the default 500 MB limit to 2 or 5 GB. But the option to increase the limit is available only in the Pro and Pro Plus editions of CCleaner. 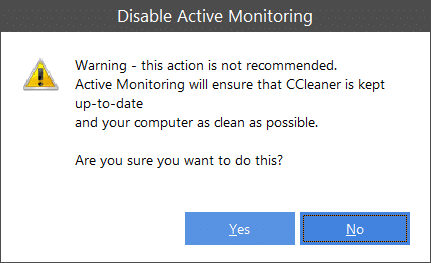 So if you’re using the free edition of CCleaner and don’t like to see the CCleaner Alert popup, you need to turn off the active monitoring system. As disabling active monitoring system won’t change the default behaviour of CCleaner except that it won’t run in the background in search of junk files, it’s safe to turn off active monitoring system. You can always manually run CCleaner and scan the system to get rid of junk files. Also, the active monitoring system turned on means CCleaner is continuously running in the background to scan for junk files. Turning off active monitoring system will also free up some system resource, relatively small though. Once you turn off active monitoring system, not only the CCleaner Alert popup will stop making the appearance but the CCleaner icon will also disappear from the system tray area. So complete the given below instructions to turn off active monitoring system to get rid of CCleaner Alert popup in Windows operating system. Step 1: The first step is to open CCleaner window. 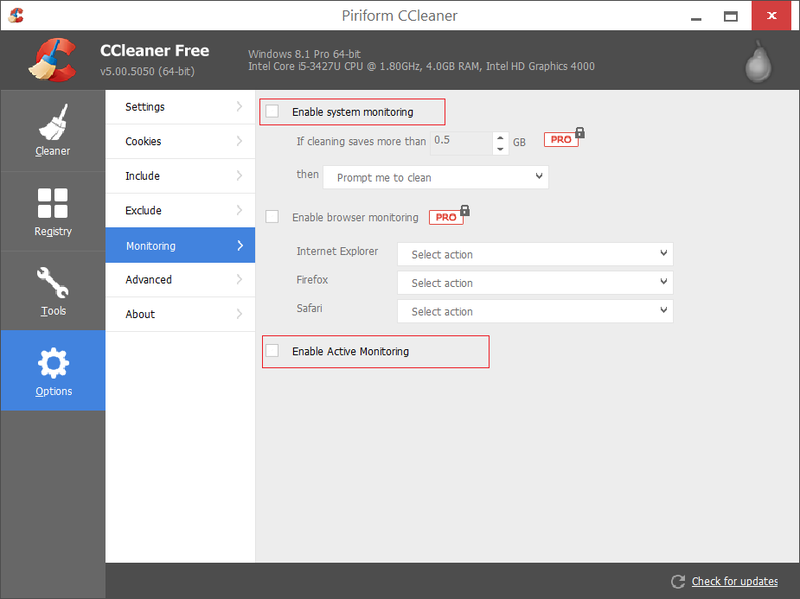 Step 2: On the main window of CCleaner, click the Options icon located in the left pane and then switch to Monitoring tab. Step 3: Now, on the right hand side of Monitoring (see picture) tab, you need to uncheck two options named Enable system monitoring and Enable active monitoring. As you can see, in order to turn off Active monitoring, we need to first uncheck Enable system monitoring option. When you see the confirmation dialog box, please click Yes button. That’s it! CCleaner will no longer surprise you with the Alert popup. I did what you advised Unchecked bothe boxes & conformed Yes. It made no difference i’m still constantly getting pop ups to upgrade to Pro? Just what I needed! Thank you, thank you, thank you!!!!! THANK YOU! This pop-up has been driving me nuts. I’m happy to finally be rid of it. Thank you so much, exactly what I was looking for !